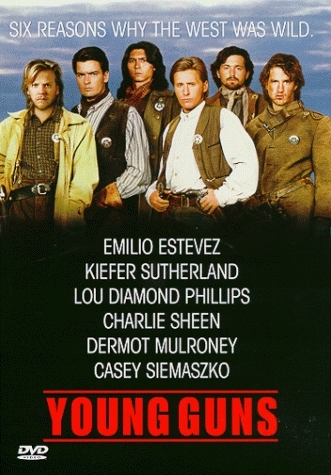 Here's some interesting tidbits I've dug up from various sources about the "Young Guns" films. Tom Cruise was disguised with a beard and mustache and appears as a bad guy that walks out of a door and is shot. He was added because he was visiting the set and said he had never been in a film gunfight, or so the imdb says. According to one site I visited, this is false, and although Cruise was on the set visitng his pals, he didn't actually have a walk on role. I've never spotted him anyway. Jon Bon Jovi, like Tom Cruise, is rumoured to have a small role in one of the films. Apparently, Jon Bon Jovi is shot up in a quick scene in "Young Guns II". I sadly, have never spotted him either; if he was in it at all. Charlie Sheen and Emilio Estevez are brothers. They have starred in several films together - including "Men at Work" and "Rated X". The family name is actually, Estevez. 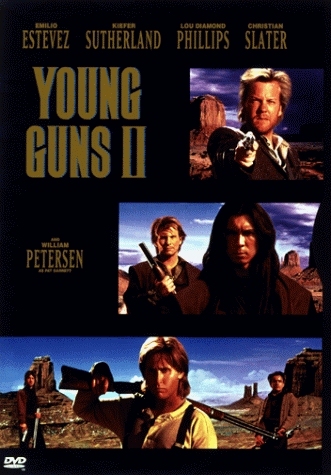 A Year after "Young Guns II", Lou Diamond Phillips and Kiefer Sutherland reunited for the action film "Renegade". After Billy kills the man in the bar, Doc says that Billy has killed five people, but if you count up the bodies that Billy has killed before then, it's seven.